Energialternativ, originally uploaded by appel. When setting up my new Vista computer I ran into a minor localization issue. 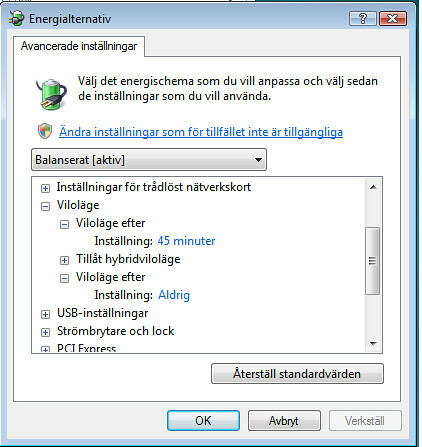 In the power options in my swedish Vista there are two things called “vilolÃ¤ge”, sleep in the english version. The first one is most likely sleep, and the second one hibernate. Found a neat applet for making sure that I have the latest and most secure versions of my software created by Secunia. It’s called the Secunia Software Inspector and when I ran it on my computer I found that both my Java JRE and Adobe Flash were out of date. Keeping up with security fixes is a pain. Also, the latest version of uTorrent apparently has a vulnerability [secunia.com]. I wonder why this isn’t made really obvious on uTorrent’s homepage? Microsoft has decided to add a mute option for the startup chime in newer builds of Vista. Fixing “LUA bugs”, Part I by Aaron Margosis, an interesting read about how to handle applications that needs an administrator account to run even though they really shouldn’t need it. The first, and best, solution is to let the applications developer fix it. Although it sounds great on paper, right now it seems really hard to convince some developers to make sure their applications run as a non-admin user. At least that is what I found out when I contacted Sony-Ericsson. But game developers are probably the worst when it comes to making their games run as non-admin. If their plan has been all along to make me stop playing PC games and move over to playing only on my Xbox they’ve succeeded. When I recently reinstalled Windows XP on my main computer at home I decided to try to use an limited user account as much as possible. An interesting experience to say the least. After I had installed Windows I created two users, me and an account with administrator rights called Installation that I intended to only use when installing new applications and system maintenance. Using fast user switching to switch back and forth when necessary has made installing new things relatively painless. Not that I install new things that often, not after the initial rush to get the things I knew I wanted to use installed anyways. Not all applications play nice when run with limited privileges though. A little bit disappointing but not very surprising, and since it is mostly minor issues I’ll probably continue with a limited user account as my main account. Previously I used a bittorrent client called BitComet, but it wouldn’t work correctly now. Even if I made the .ini file in its application directory writable by all it wouldn’t download torrents. So I switched to ÂµTorrent that I had read about a while ago and it worked just fine. KeePass Password Safe, an opensource application I use for storing passwords. It also uses an .ini file in its application directory to store settings, which is by default readonly. Easily worked around, and it seems to work even if you don’t allow it to write to its .ini file, but you loose the ability to change any settings in the interface. The software that came with my phone that among other things has a tool that lets my synchronize my contacts and calendar with Outlook, Sony Ericsson PC Suite, wont start at all. I tried to contact their support about it but after having filled out a support form I get nothing but 404:s when trying to submit. It would appear not only their phone hardware has issues. FeedDemon 1.6 RC2, my favourite rss-reader, gave some error when started until it had been started once using an administrator account. Hopefully it will be fixed before the final version is released, installer issue probably. Yet another chat client I use, Xfire, has a file download feature that does not work since it writes the downloaded files to its application directory, and I haven’t found a way to change that location. But chatting works, and that is what I use it for. Update: Battlefield 2 has started working again, earlier it said invalid key even if I started it on an administrator account, but when I tried today I could play.